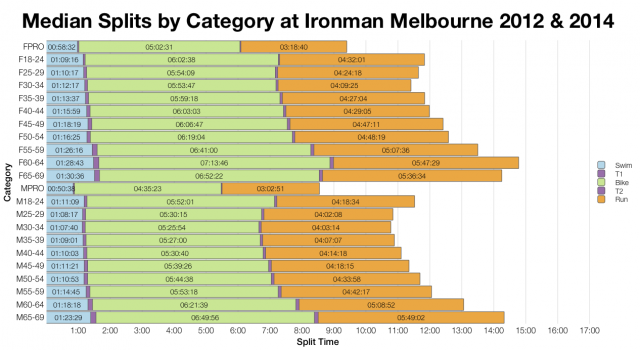 Ironman Melbourne, the Asia-Pacific Championship, took place on Sunday. In this fourth running of the event conditions appear to have been favourable, at least until athletes hit the run. While swim and bike times are comparable with previous years, run times are distinctly slower. Enough to make 2015 the slowest year seen in Melbourne. I’ve excluded 2013 from any comparisons due to its shortened swim. 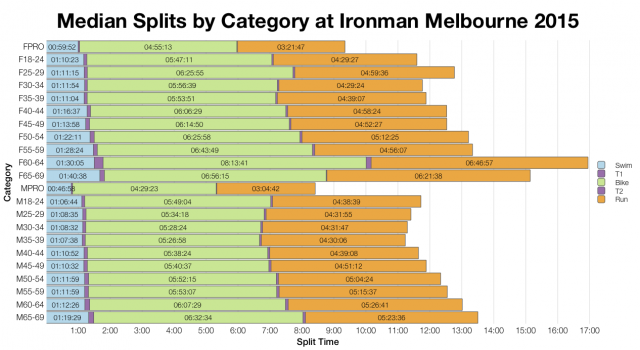 As noted above, 2015 swim and bike splits are generally comparable with their 2012 and 2014 counterparts, but run times are almost universally slower. Whatever the conditions were that caused it (I’ve read of strong winds on the run course), their impact is clear and spread across the age groups. 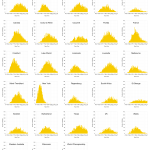 The affect on the pros was less significant, but run averages were down in their ranks too. Comparing the distribution of run finish times gives a much clearer picture – from the front to the back of the field times have been affected. It’s not unusual to see conditions impact the 50th percentile to such a degree, but also seeing the top 5% come out around 15 minutes slower is. Such a shift in run times inevitably shifts the overall finish times; this year just over 10% of the field broke the 10 hour mark, in previous races the figure is closer to 20%. 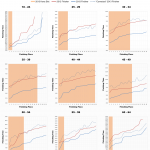 If we go to the very front of the age group field then we do see a lot of slower than average times (blue line versus red line). However, it’s not true in every age group, nor consistently across the field. 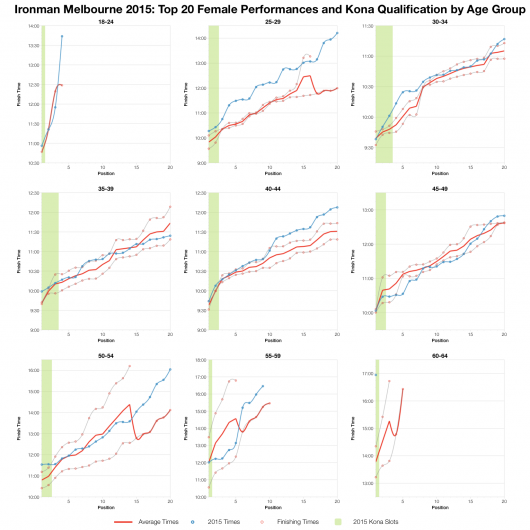 Based on the graph for the 60-64 male age group we might think this had been a particularly fast year! 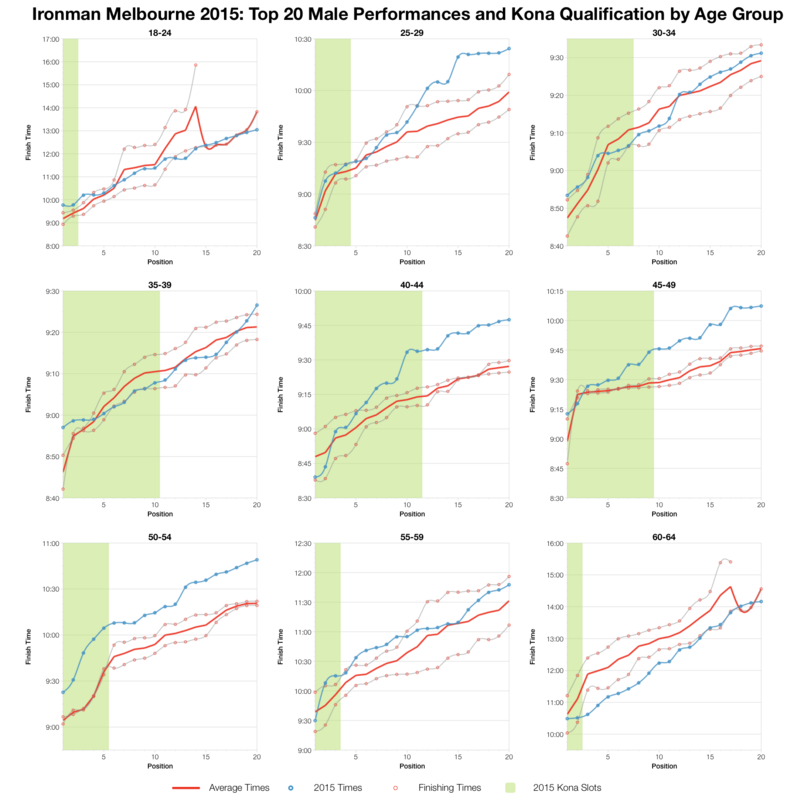 I can’t say why an individual age group outperforms the others, perhaps a particularly strong field entered this year. The general trend would still suggest a slower than average year. It’s not unusual to see the very fastest age groupers still perform when the majority of the field has a harder time. 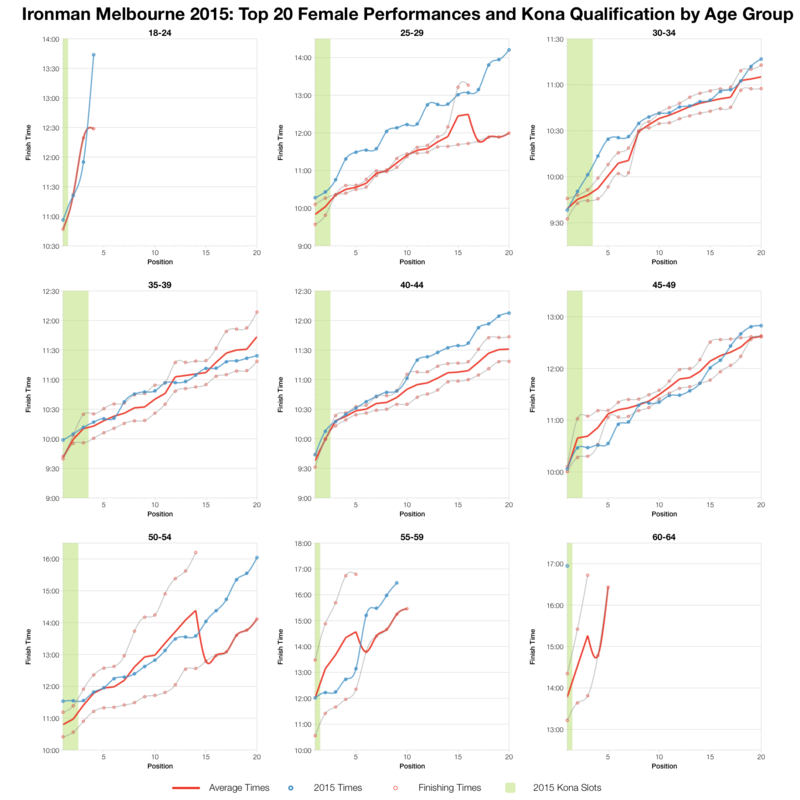 At the very front of the age group race – as with the pros – the impact of conditions tends to be less significant (why I was a little surprised to see the run impacted so much for the top 5%). 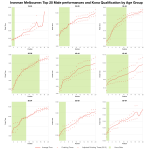 This can simply be a matter of being off the course ahead of the toughest conditions (missing the worst of the heat or wind), but it also reflects on the level of fitness at the top of the age groups. There is no room for a bad day if looking to Kona qualify. 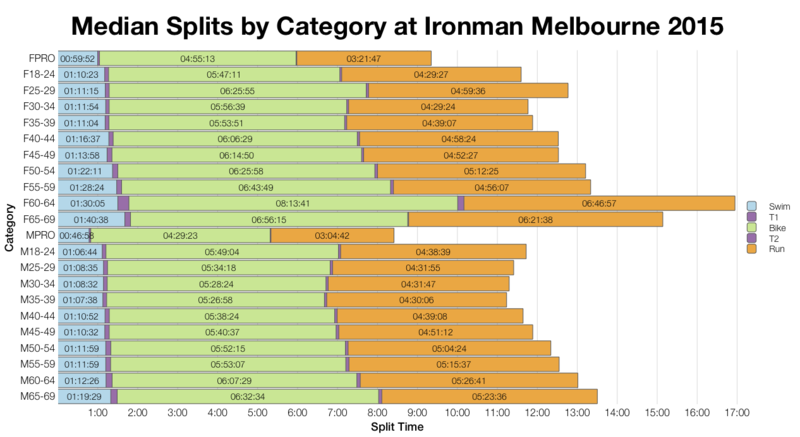 You can access a spreadsheet of the full results and splits from Ironman Melbourne 2015 on my Google Drive.